The intention of the Embodied Flow Somatic Movement Therapy (EFSMT) Program is to offer the practitioner tools to work with groups and individuals to enhance mental, emotional, physical and biological functions in order to bring optimal well-being and healing. The program integrates non-dualistic tantric philosophy, embodiment practices, humanistic psychology, Mind-Body Medicine techniques, osteopathy, and somatic body-work therapies. The term somatics is derived from the Latin word soma, meaning "the living body." Somatics is an approach to experience that accesses the full intelligence of our body and the subtle conversation of our subconscious in order to actualize our potential and support a deep inner process of healing. From an Embodied Flow perspective, healing is the processes of returning to our experience of wholeness. This sense of flourishing and well-being can be achieved by a range of practices that are validating, clarifying and self-expanding such as recognizing one’s optimal potential and strengths, identifying boundaries, providing a felt sense of agency, finding more ease and efficiency within the muscles and joints of one’s body, or bringing consciousness into one’s experience of their own body. This felt sense of self, also known as Embodiment, leads to an experience of being comfortable in one’s own skin and therefore able to engage with life more fully. Ultimately this facilitates: self-awareness, boundaries, self-esteem, emotional regulation, empathy, enhanced cognitive processing, easeful decision making of complex situations, body related self confidence, a greater sense of self-control, enhanced intuition, and a feeling of being both authentic and interconnected with others and the environment. An Embodied Flow Somatic Movement Therapist fosters these benefits by empowering their students and clients to discover pathways, transmute obstacles, and build inner resources to reach their desired goals. Our innate state of being is movement. From the perspective of our cells in continuous regrowth and genesis, the motion of our emotions, the developmental cycles of our sense of self and relationships- we are in constant flux of evolution. As every part of us is in continual growth and change, wherever there is stagnation (lack of movement) there is greater potential for dis-ease; wherever there is movement there is opportunity for vibrancy and health. In Embodied Flow we recognize that movement is foundational for attaining awareness, transformational processing, and actualizing our students' and clients' goals. The primary objective of an EFSMT is to support others in their journey of self actualization, supporting and enhancing the aspects of their self that are in strength and movement, while gently supporting areas of their life that are in shadow or stagnancy to once again become integrated into the matrix of that individual’s well-being, ultimately allowing them to step into and sustain a state of flow. WHAT MAKES EMBODIED FLOW SOMATIC MOVEMENT THERAPY UNIQUE? The non-dual lens of this program recognizes that mind, body, and spirit are one, that each individual is already whole, and that addressing the obstructions getting in the way of that wholeness leads to well-being. The process of facilitating flow with this deeper understanding of therapeutic alignment allows you to contact the complex layers of an individual from a holistic approach. An Embodied Flow Movement Therapist will exit the program with the capacity to facilitate healthy and integrative movement on a multitude of levels including: physiologically, kinesiologically, psychologically, cognitively, spiritually, and relationally. In order to build the skills and confidence as an Embodied Flow Somatic Movement Therapist, we have created a curriculum that combines and integrates many practices from: Somatic Therapy, Body-Mind Centering, Continuum, Thai Massage, Osteopathy, Shamanism, Energy Medicine, Humanistic and Transpersonal psychology, Dance/ Movement Therapy, Cranial-Sacral Therapy, Somatic Experiencing, Focusing Technique, Emotion Focused Therapy, and Tantric and Buddhist meditation and psychology. The breath of knowledge and techniques provided in this program offer each student a strong foundation of tools and support to assist them in customizing and developing the type of movement therapist they want to be. Practical and Theoretical foundations of Humanistic Psychology, Mind-Body Medicine, and the holistic integration between: biology, spirituality, sexuality, social and relational patterns, and psychological function. 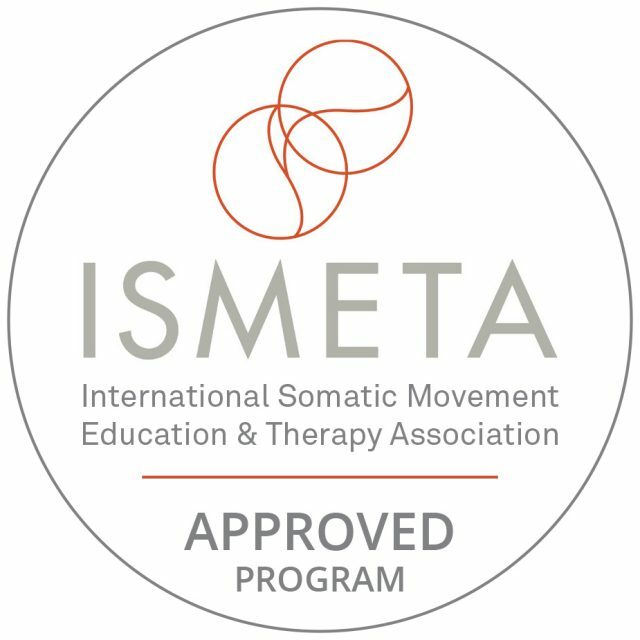 The Embodied Flow™ Somatic Movement Therapy Training program maintains the high standards of an Approved Training Program of the International Somatic Movement Education and Therapy Association (ISMETA). Our graduates meet all requirements to become Registered Somatic Movement Educators (RSME) and Therapist (RSMT). After students have successfully completed the Body and Mind Modules of our 300hr Advanced Training they are eligible to join our Embodied Flow™ Somatic Movement Therapy Module.